A federal jury acquitted Tyson Foods and three managers Wednesday of hiring illegal immigrants from Mexico and Central America as part of a nationwide conspiracy to boost production and profits. The jury of seven men and five women deliberated for less than a day before acquitting on all charges. "The verdict confirms that Tyson Foods made a concerted effort to hire properly and abide by the law," company spokesman Gary Michelson said in a statement handed out immediately after the verdict was announced. "While we're pleased with today's verdict, it's unfortunate that Tyson Foods and our team members were needlessly subjected to this ordeal," Michelson said. Tyson executives testified during the 7-week trial that Tyson doesn't encourage the hiring of illegal workers and said managers who did so acted against corporate policies. However, two former managers who were indicted but entered plea deals testified that they were doing what the company demanded when they went along with the hiring of illegal workers. In closing statements Tuesday, a company attorney said the defendants were victims of an imperfect government system of screening immigrants and there was no conspiracy and the Springdale, Ark.-based meat giant. Earlier, Assistant U.S. Attorney John MacCoon said Tyson's top executives knew illegal workers were being hired at poultry plants. "Headquarters had a million red flags that things were not right," MacCoon said. Since the case began, the judge dismissed 24 of 36 charges stemming from a three-year undercover investigation of Tyson. Remaining were charges of conspiracy, transporting illegal immigrants and fraudulent documents. 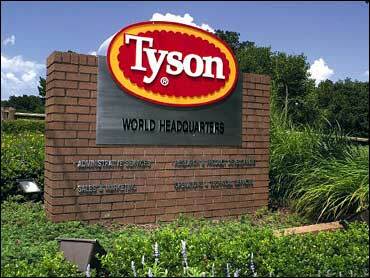 In all, six managers were charged along with Tyson in a December 2001 indictment. One fatally shot himself a few months later, and two others made plea agreements in January and testified for the government. Robert Hash, 50, a regional vice president and the highest-ranking Tyson official currently on trial, had faced seven charges, including two conspiracy counts. A single conspiracy charge had remained against plant manager Keith Snyder, 44. Another defendant, Gerald Lankford, 64, had been accused of conspiring to violate immigration laws and obstruct their enforcement. The managers had faced jail time and fines if found guilty. A conviction on the charge of conspiring to defraud and obstruct enforcement of immigration laws carries a maximum sentence of five years in prison and a $250,000 fine.